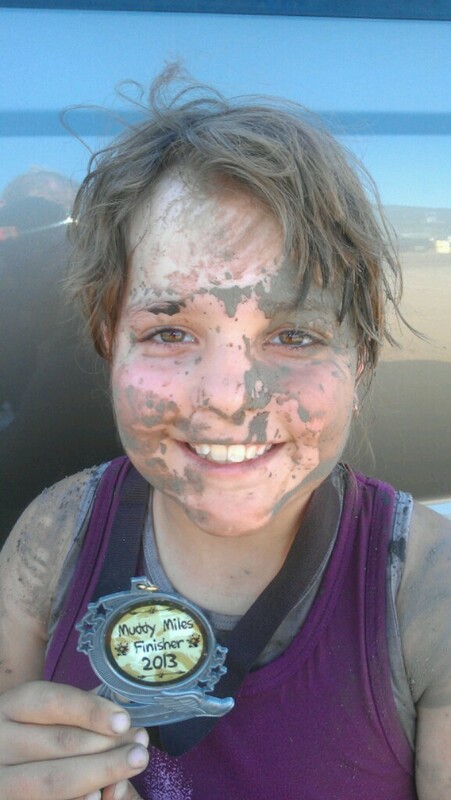 Being Frugal and Making It Work: Muddy Miles Mud Run - North Idaho's Muddiest Race! 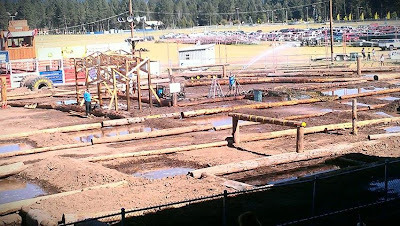 Muddy Miles Mud Run - North Idaho's Muddiest Race! 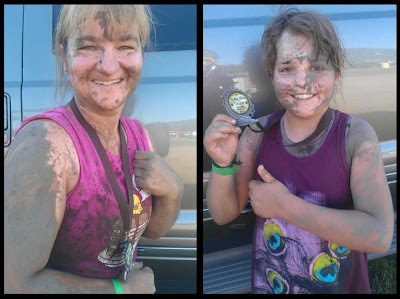 Mud runs and color runs are all the rage, and this summer my daughter and I were fortunate enough to do both for the very first time! Over the weekend we got down and dirty, and ran through the mud at the Muddy Miles foot race. Muddy Miles is North Idaho's Muddiest Race! 2 miles of mud, fun and obstacles. Flying water balloons and silly string from those innocent by-standers. Ducking and dodging through the mud and puddles as you tromp and prance through, over and around obstacles. I have always wanted to find a big mud pit and run through it, or even better yet get into a mud fight... FINALLY, my daughter and I were able to mark that off of our bucket list! We showed up at Muddy Miles early enough to watch some of the other participants get stuck in the mud. We were both laughing and couldn't wait for it to be our turn. We made sure that our shoes were tied tight (or so I thought), and when it was our turn we ran straight into the thickest, sloppiest, deepest mud I have ever been in. It was thick, knee deep and sucked my right shoe off in a matter of minutes! I guess it wasn't tied as tightly as I thought it was. So, up to my elbow it was as I pulled my shoe out of the muck. My daughter was ahead of me and when she turned around to see where I was at, she realized what had happened and instantly started laughing... I took one look at her and knew that she was having the time of her life! She was already covered from head to toe in mud and we weren't even 5 minutes into the course. The course was muddy, dirty, and had a variety of fun obstacles: tires, logs, culverts, nets, hay bales and wooden walls. Over the logs and dirt mounds, through the culverts, over the tires and under the net... there was no way you were getting through this course without getting muddy from head to toe! At the end of the muddy course was a large dirt mound covered in plastic. Once you got to the top, you got to slide into a huge muddy puddle for your grand finale! Standing at the finish line were people cheering you on, congratulating you on your finish, and handing out Muddy Miles Finisher 2013 medals! I thought that it was pretty cool that every finisher received a medal, and my daughter was super excited to get hers! A photographer was at the finish line with a white backdrop set up for the perfect photo opp for anyone who wanted to have their muddy faces photographed! There was also a water station so you could rehydrate and/or wash the mud off of your teeth! A little farther away they had shower stations set up - for those who wanted to clean up before getting into their vehicles! The fun didn't end when we left Muddy Miles! We were in our jeep - no doors, top off! On our way home we were getting laughed at, funny looks and fingers pointed at us. We even got a few thumbs up! Some of the mud run side affects include laughter, sweat, dirty fingernails, and amazing Facebook update pictures. That's right... my profile picture is currently a picture of my muddy face! We have already decided that we will be doing the Muddy Miles mud run again next year, and hopefully Daddy and brother won't be at a wrestling camp and can join us! Who knew getting this dirty would be so much fun! We had a BLAST! 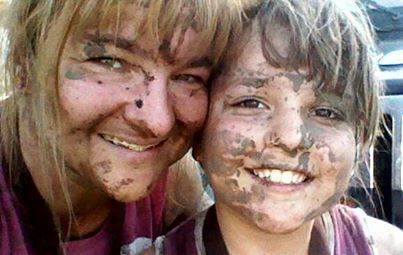 Have you ever completed a mud run? Oh my goodness, this looks like SO much fun! I wonder if I have one similar in my area. What a great experience for you both to have together. What a terrific time you must have had. This looks like a blast! What a fun memory you guys made! I love your smiling faces with your medals. I'd have to psych myself up for it, but if I did it, I know it would be a memory I'd treasure! Very fun! Looks like so much fun! I haven't done one yet. The last one here was a couple of weekends ago, but I couldn't go. Maybe one of these years! What an absolutely fun activity to do together. I would love to do something like this with my boys. Looks like you all had a great time! Hurray for mud runs! My husband just completed on at our Air Force base a couple weeks ago. He's hooked! SO fun!!! I love the pics!!!! How awesome! I'd love to do something like that, wish I just had the stamina and motivation lol it looks so fun and something fun to do as a FAMILY as well!! GOOD JOB!! I love that your daughter did this with you! I'd love to do a mud race one day! I've never done one, but heard the name. Now I know exactly what they are. What fun! It looks like you had am amazingly fun time!